St. Paul’s Church is on the corner of Alexandra Road and Queens Road, between Kingston Hospital and the Kingston Gate to Richmond Park. The entrance is on Alexandra Road. Public Transport: St. Paul’s is close to several public transport links – Norbiton railway station is a 10-15 minute walk away. Nearby bus stops include the 371 which stops on Park Road, the 57, 85, and 213 which stop on Kingston Hill. Parking: St. Paul’s has no car park and spaces along our neighbouring roads can be hard to find at busy times. Please park with consideration to our neighbours. Nearby roads have parking meters in operation Monday to Saturday 8:30am to 6:30pm. Parking is free all day on Sundays. 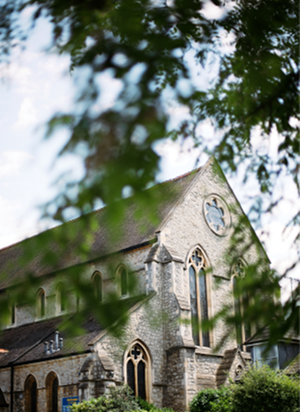 If you would like further information about anything to do with the church, including church bookings, reading of wedding banns and general enquiries, please contact Caroline Dennis in the church office by using the form on this page. Or you can email her on office@stpaulskingston.org.uk or call 020 8549 5444.